I last travelled to the Philippines over 15 years ago with my family. My aunt and her husband were renewing their vows on their 25th wedding anniversary in the Philippines where they met as teenagers. At least, that’s how I remember the story. Our entire family on my mom’s side went to the islands to celebrate this beautiful occasion. My mom, born and raised in the Philippines, had not been back to the homeland since she was about 20 years old. My mom was really excited to show me, my brother and father, where she grew up. We got to see the grade school she attended and the house she lived in as a child with her other nine siblings. It was a sweet and humbling experience. A recent trip to the local Asian food supermarket gave me flashbacks to my childhood and that family vacation, where I found longanissa and ube ice cream in the frozen food aisle! I was giddy with excitement. 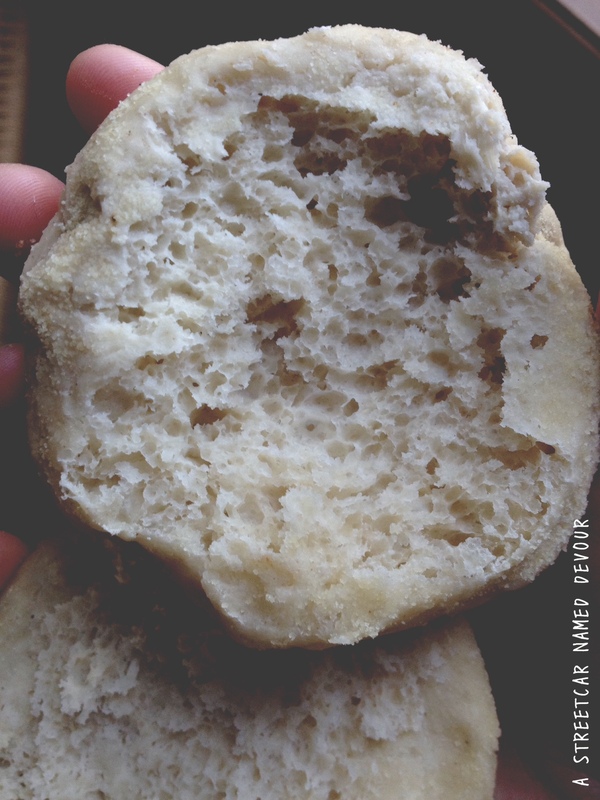 For this week, I posted a recipe on homemade English Muffins. 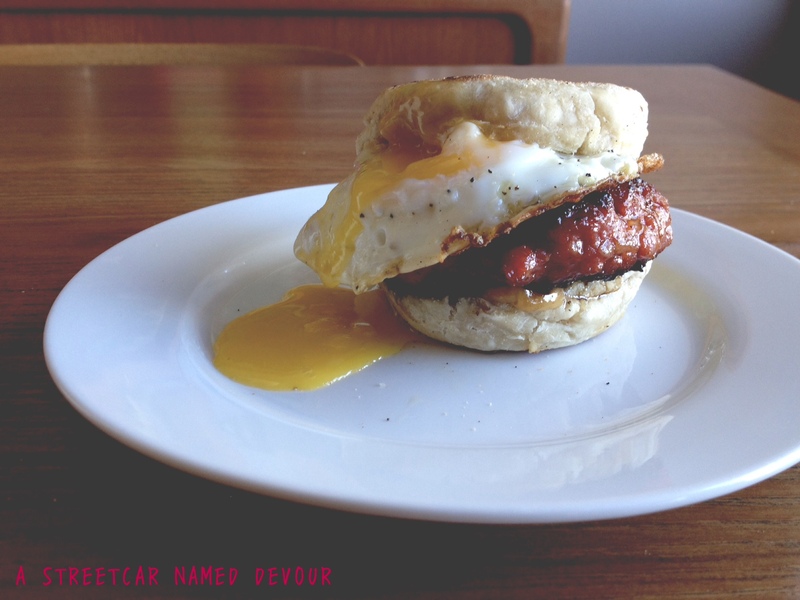 Then I thought afterward, why don’t I make my own sausage breakfast sandwich with the muffins and longanissa? Why not add an egg and cheese, too? 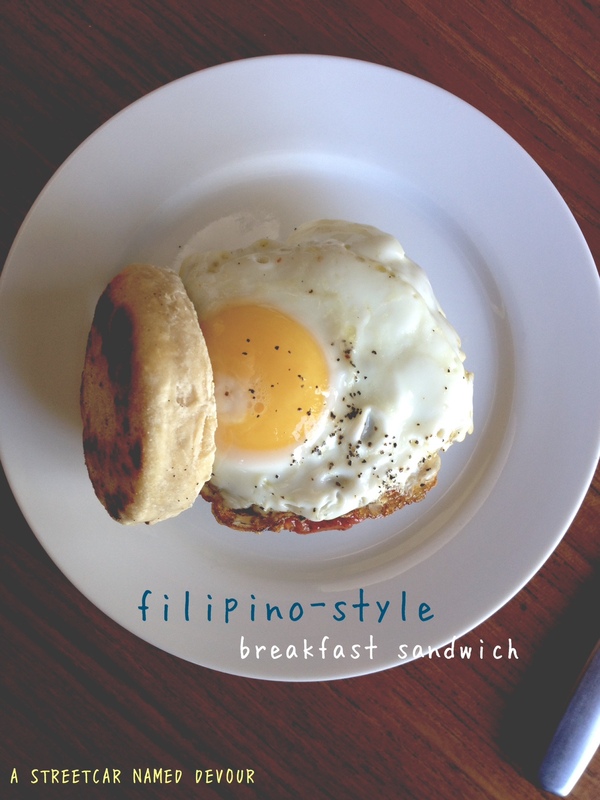 This dish is a sweet little mish-mash of my Filipino-American heritage. And I’m happy to share it with you! Defrost the sausage (if frozen). Remove the sausage from the casing by using a knife to cut a small slit. Shape the meat into an equal-shaped patty. Heat a non-stick skillet or cast-iron to medium-high heat. 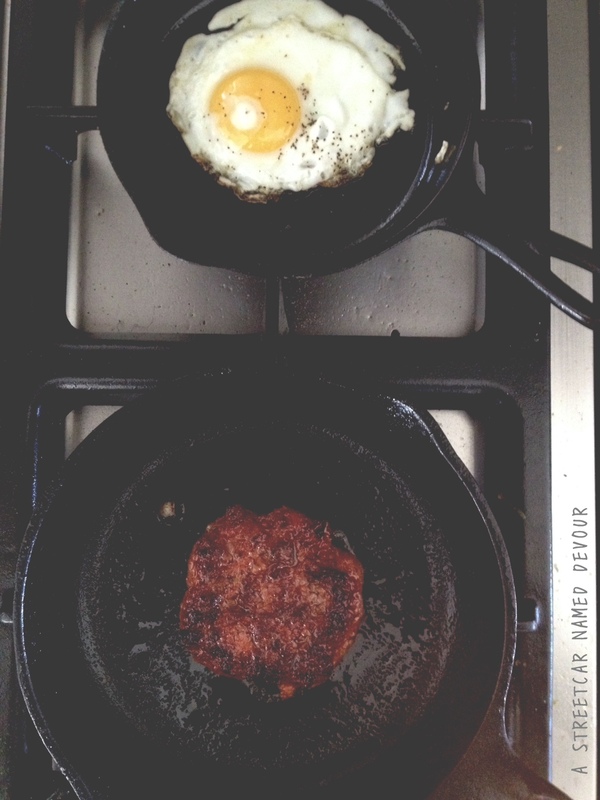 Drizzle the pan with the oil and place the sausage patty onto the skillet, creating a nice sear on the side. Cook it for about 4 minutes. Flip the patty and cook for another 4 minutes. Check the center for doneness. Cook further if needed. Turn off the heat and place the cheese on top of the sausage patty. Use the skillet’s lid to cover the patty, allowing the residual heat to melt the cheese. In another skillet, heat the oil over medium heat, making sure the entire base of the pan is coated evenly. Crack the egg into the pan, allowing the egg to cook fully. Swirl the pan a bit to make sure the white is entirely cooked. Sprinkle with salt and pepper. Turn off the heat. Cut the English muffin in half and place into the toaster to re-heat. Spread some butter on the inside of the bread and place the sausage with cheese onto the base. Top with the egg and cover with the other half of the muffin. Easy.